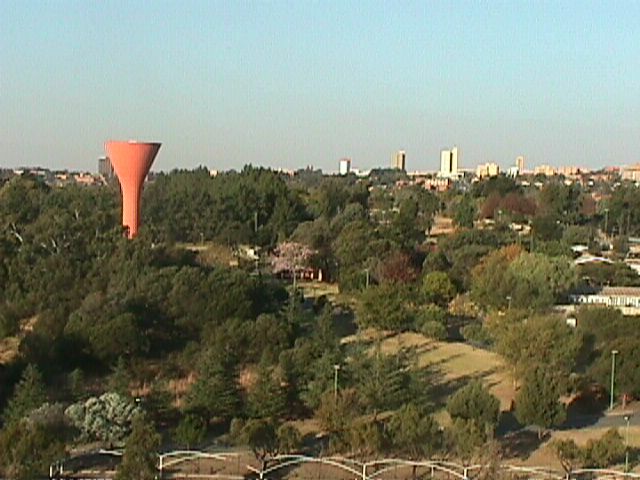 Randburg is a metro area in the northwestern suburbs of Johannesburg, and consists of 32 suburbs that were amalgamated on 1 July 1959. The name Randburg is derived from the South African currency, the Rand, which replaced the pound sterling in 1959, just before South Africa became a republic. The history of Randburg goes as far back as settlements by Boer pioneers in the 1850s and 1860s. The first farms were Klipfontein, Driefontein, Olievenhoutspoort, and Boskop. These four farms were then sub-divided among the sons of the early settlers. Driefontein, which was the original farm, extended from the northern boundary of Bryanston to the the present Braamfontein, which belonged to one J L Pretorius. In 1886 when he died, the farm was divided among his sons who later sold their portions. A portion of the farm was subsequently bought by the widow of Jacobus Brink of Pretoria. One of the first true Randburgers was her son Daniel Brink, who started farming on a portion of Driefontein in 1906. The portion was so large that it was later sub-divided into the suburbs of Kensington B, Beverley Gardens, Brian Brink and Vandia Grove. Randburg's first windmill - in Milner Street - was erected in 1924 by Daniel Brink and is still in the possession of one of Brink's descendants. Charles Rocher bought a portion of the farm Driefontein and renamed his estate Bordeaux after the French city where his family had originated. Later, he sold it to a property company. A portion of Boskop was bought by the famous Rand entrepreneur, John Dale Lace on which the house of the Labuschagnes was built. Dale Lace and his wife converted the house into their country residence as this was most fashionable among the elite at that time. The house was named Hy-Many House. The possible lure of gold led numbers of speculators in England to invest money in plots in Johannesburg North which was a couple of hours on horseback from Johannesburg. This is where Abe Bailey and colleagues were investing. Which is why names like Carlton Road, Church Street, and Pritchard Street sprang up in the veld to give the impression that the township was part of the Golden City. Randburg's history is inextricably linked to that of Johannesburg. The area was gradually developed and, in 1928, stands could be obtained for as little as R50 an erf - a deposit of R10 and monthly payments of R1 a month in today's money. A fair sized home cost approximately R1 200. A tram ticket to downtown Johannesburg cost five cents. Many Afrikaners, preferring wide open spaces to city life, flocked from Johannesburg to settle in the north west. Not long afterwards, development started which made life a little easier and in 1955/56, electricity was supplied to limited areas. Commerce, services and trade began to flourish. In the 1950s the area had less than 9 000 inhabitants in nine suburbs and by 1959 there were 13 Townships. Then came the question - should this area be incorporated into Johannesburg or should it become an independent municipality? Most of the residents insisted on their own town. It was decided that a competition be held to find a name for the new town. The prize was 100 pounds. Editors of six newspapers, as well as Mr Nienaber of the Akademie vir Wetenskap en Kuns, and Mr Thys van Lille of the SABC were to be adjudicators. A total of 700 names were submitted. In all, 12 names which included the word "Rand" were proposed. The three chosen as final proposals were Randburg, Mooirand and Randstad. Six lucky people who proposed Randburg shared the 100 pounds. On 23 May 1956, a town council action committee was formed with the goal of establishing an independent town separate from the then North Western Area Committee of the Peri-Urban Council. Robert van Tonder, who settled in Ferndale in 1952, was elected chairman. An independent magisterial district was created in 1975 and the Magistrate's Court was established. District headquarters for the SA Police was housed in a new building in 1978. Over the past 30 years, developers and investors seized the opportunities in the eastern section of Randburg - opportunities that are being created afresh in the new and bigger Randburg West. It is here, where developers and investors have the opportunity to take a second bite at the apple, that the framework has been created for sustained growth and development in the fields of property development, light industries, township development, retail outlets, and service industries. With a clear vision for the future of the Randburg of tomorrow, a number of planning studies in which the precise details of future residential trends, manufacturing and industrial requirements, retail developments, and recreational needs, have been planned. With this vision of Randburg's development over the next couple of years and beyond, future residents and investors are welcomed in advance. With so many residents, investors, and businesses showing their loyalty to the town, a dynamic period lies ahead for Randburg. Randburg is being planned for the people who live and work in it. (Information from Randburg published by History of South Africa Community Publications cc, edited by Thea Jackson). This information was published in the Randburg Sun, 18 May 1995. The vibrant town of Randburg as we know it today, came into existence during the Great Trek when Afrikaans farmers still owned the vast majority of farms around Johannesburg. The area which now constitutes Randburg was initially inhabitated by Boers who had come to the area as a result of the Great Trek. JL Pretorius was the original owner of a farm called Driefontein, which extended from present day Bryanston to present day Braamfontein. In 1886, when JL Pretorius died, the farm was subdivided amongst his nine sons, a lot of whom sold their farms to outsiders. In 1906, Daniel Brink started farming on a portion of the Driefontein farm which was much later to be subdivided into the suburbs of Brian Brink, Vandia Grove, Kensington 'B' and Beverley Gardens. One of his farms windmills is still in existence today on a property in Milner Street! Charles Rocher also bought a portion of Driefontein and renamed his estate Bordeaux after the French city from where his family had originated. In the early 1930's Bordeaux was bought from Rocher by a property company. Another farm which was to become part of present day Randburg was called Boskop and was owned by J Labuschagne in 1860. An area of this farm was demarcated and named Klipfontein on 6 June 1865. Other owners of sections of Boskop were bought by CJ Smith and A Erasmus after 1883. In 1903, a huge portion of Boskop was sold to an established Rand enterpreneur named John Dale Lace and included the old house of the Labuschagnes. Lace converted this house into a country residence - a fashionable practice amongst the Johannesburg elite of the time. Lace then sold his portion to Tom Kelly in 1929. Kelly restored the home and named it "Hy Many". This house is still in existence today. Another section of the Klipfontein farm was bought by Scotsman William Gray Rattray in 1891. He renamed his portion Craighall after his birthplace in Scotland. Still another portion of Klipfontein was bought by business tycoon Sir Abe Bailey and he renamed his portion Ferndale. The history of Randburg has strong ties to the History of Johannesburg as a whole, which started when Gold was discovered in the area. The area of Randburg was not a part of Johannesburg's boundaries and did not share in the gold rush, only starting real development in the 1920s. By 1928, pieces of land were being sold in the Randburg area for just R50 each! (The cost of an average house at the time was R1200.) Johannesburg and its surrounding areas experienced a large influx of people during the Great Depression (1928-1934). South Africa was experiencing a four year drought at the time as well which drove even more people from the rural areas into the cities. Still, the area now constituting Randburg didn't even have electricity until 1955. The introduction of electricity in that year caused commerce and trade to flourish in the area. During the 1950s there were less than 9000 inhabitants in 9 suburbs. In 1958 the first newspaper for the North, called "Noord Nuus", was published. It is uncertain what the motivation was for buying land in Johannesburg North because it was far from the gold digging area, but several speculators put out the rumour that it was fashionable to own land in Johannesburg North and this has not changed to this day. On 20 April 1959, it was decided that a competition would be held to find a name for this newly developed area. 700 names were submitted some being Fairydale, Serena, Titania, Uniekburg, Venus, Wonderstad, Zuriel, Randburg, Randstad, Mooirand, Aandstilte, Banket, Celeste, Demos and Ego. The six entrants who proposed the name of Randburg shared the 100 Pound prize. Randburg had since 1956 been trying to be classed separately to Johannesburg be it's own Municipality. In 1956 a committee representing Randburg held a meeting to vote on Randburg's status. The board voted to have a seperate town and applied for municipal status which was granted on 1 July 1959. Then in 1968 Johannesburg tried to incorporate Randburg in its municipal area, but the Van der Spuy committee rejected the proposal and Randburg remained independent and increased Randburg's jurisdiction to 86 km squared. Today Randburg is 100 km squared. In 1972 the town council formulated its first masterplan for Randburg's development, in accordance with the the town's motto "Planning for People". This plan has laid the foundations for Randburg's tremendous growth and development. Despite this huge growth, more opportunities are arising in the Western side of Randburg which is now being developed at a rapid pace. In January 1975, Randburg became an independent magisterial district with it's own court. South African Police headquarters were established in 1978. It is only since the recent municipal elections that Randburg has lost its independent stature and its own municipality. The town currently consists of around 30 000 homes and 220 000 residents. The average growth rate of the area since 1980 is around 25%. Young people choose Randburg to buy properties in its new upmarket areas, while the more established suburbs of Greenside, Linden, and Emmarentia are still regarded as extremely valuable property. With restaurants and shopping centres on almost every corner, Randburg is a very popular area. This information was also published in the Randburg Sun, 7 September 2001. The area that is known today as Randburg was formed by the four farms of Klipfontein, Driefontein, Olievenhoutspoort and Boskop, and the earliest people that settled there were Boer pioneers in the 1850s and 1860s. The farms were subdivided over the years, the first of which was Driefontein, which was subdivided into the suburbs of Kensington B, Beverly Gardens, Brian Brink and Vandia Grove. An additional portion of the farm was bought by Charles Rocher and named Bordeaux, which was to become one of the early pioneers of Cape deciduous farming. The farm Boskop also had an important role in the history of Randburg with a part being proclaimed as Klipfontein, and in 1891 a part of it was renamed Craighall, with another part being called Ferndale. Sanlam Centre in Randburg was first shopping mall built in the country. This shopping centre was renamed to Randburg Square in about 2005.